Class-leading V8 engines, peerless 6-speed transmission, Terrain Response upgrades and external styling enhancements all combine to ensure the 2011 Range Rover retains its crown as king of the luxury SUV segment. The range-topping supercharged and naturally aspirated LR-V8s deliver supreme performance and economy. Developed in-house by Land Rover engineers, their uncompromising, world-class performance are not accompanied by an increase in fuel consumption and emissions compared to their predecessors. The 2011 model year Range Rover is further enhanced by improvements to the Terrain Response system in the form of Hill Start Assist and Gradient Acceleration Control. Inside the cabin there are available illuminated treadplates for the front doors and improvements to the entertainment system. Dynamically, the Range Rover is equipped with the last word in suspension systems incorporating Adaptive Dynamics technology which exercises firm control over the body through turns while cosseting the occupants with the svelte ride Range Rovers are famous for. Active safety aids include available Adaptive Cruise Control, Emergency Brake Assist, available Blind Spot Monitoring, available Automatic High Beam Assist and an available Surround Camera System. Detail improvement to the exterior include new ‘Jupiter’ grilles and side vents for the non-Autobiography naturally aspirated models. A new Exterior Design Pack option gives customers the chance to give their Range Rover a more individual look and new colors and wheels have been added to the range. The incomparable 5.0-liter LR-V8 supercharged and naturally aspirated LR-V8 engines, brand new in 2010 and designed specifically with Land Rover vehicles in mind, remain in the Land Rover line-up unchanged for the 2011 model year. Without doubt, these two engines raise the art of V8 engine design to a whole new level and set new benchmarks for economy, refinement and performance when they first appeared in 2010. Both lightweight engines are super-efficient and both are compliant with the stringent US ULEV2 emissions regulations. Delivering 510bhp and 461lb/ft, the supreme supercharged engine is 28 percent more powerful than its predecessor and produces 10 percent more torque. This massive performance allows the supercharged Range Rover to accelerate to 60 mph from rest in a mere 5.9 seconds. The supercharged engine is joined by the naturally aspirated LR-V8 producing 375 hp and a matching 375 lb-ft. These figures represent an increase of 25 percent more power and 10 percent more torque than the earlier 4.4L V8 combined with a 7 percent reduction in fuel consumption and similar cut in CO2 emissions. 0-60 mph takes just 7.2 seconds, only 0.1 seconds slower than the previous supercharged engine. Key technologies include the sixth-generation, twin-vortex Eaton supercharger whose high helix rotor improves thermodynamic efficiency by 16 percent compared to earlier designs and renders the unit almost inaudible. The 2175psi (150bar), multi-hole, spray-guided direct injection system fully optimizes combustion for both power and economy. A number of clever design features such as the industry-first, torque actuated variable camshaft timing on all four cams and reverse cooling all contribute to engine efficiency, performance and in-car comfort. Clever management means no fuel is wasted in the production of energy for the Range Rover’s electrical systems. Land Rover’s IPMS (Intelligent Power Management System) ensures the alternator does no more work – and the engine consumes no more fuel – than is strictly necessary. Rather than maintaining the battery charge state at an unnecessary 100 percent, IPMS aims to maintain the battery at 80 percent charge to avoid the alternator working harder than it needs to. The alternator is configured to charge wherever possible when the car is slowing (rather than when accelerating) recovering kinetic energy in the process. Charge rates are carefully moderated when cold to prolong battery life. For 2010, the Range Rover’s award winning Terrain Response system was enhanced by the addition of Sand Launch Control for easier drive-away, revisions to the Rock Crawl Program for greater composure on rocky terrain and Gradient Release Control, which inhibits the rate of initial acceleration when descending steep inclines. In 2011, there are two further enhancements, Hill Start Assist and Gradient Acceleration Control. Hill Start Assist retains the initial driver-generated brake pressure, long enough for the foot to move from brake pedal to throttle without the car rolling backwards. The brake is released after a sufficient time has elapsed or when the engine is supplying enough torque to move the car up the hill. Hill Start Assist is always available, not selectable and neither is its operation indicated to the driver. Gradient Acceleration Control is designed to provide safety cover on severe gradients when the driver does not have Hill Descent Control engaged. By pressurizing the brake system, GAC slows the car to a limit determined by the throttle position when the car is descending the slope in the driver’s intended direction of travel. This includes descending the slope forwards in drive, or rearwards in reverse. Otherwise (such as descending while facing up the gradient with Drive selected) GAC restricts speed to 5km/h for up to 20 seconds, allowing the driver to regain proper control. 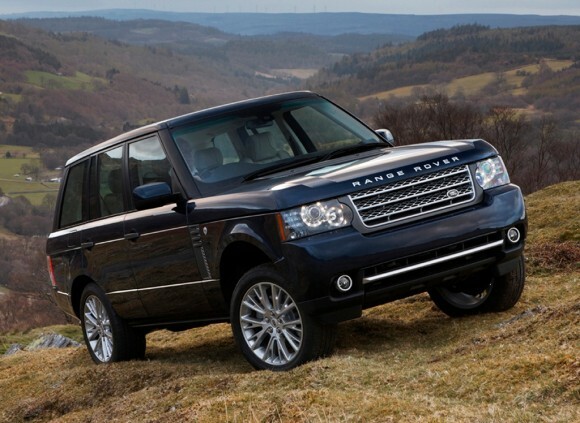 For 2011, Range Rover customers can choose the optional Exterior Design Pack available in a choice of eight colors. The Exterior Design Pack comprises a revised front bumper with fog lamp surrounds, front grille and side vents in Titan finish, revised side sills, rear bumper and stainless steel exhaust finishers. The range of exterior paint colors has been expanded with two further choices, Fuji White (replacing Alaska White) and Baltic Blue (replacing Buckingham Blue). From the summer of 2011, optional illuminated treadplates will become available on front doors only, with the Range Rover name backlit by LED lights.